One thing I’ve always loved about Opera were the customization options. I’m referring to the way it looks and not add-ons/extensions. When Opera 15 came out everything was gone. They didn’t even allow the bookmarking of pages. But gradually, over time, some of the options came back. 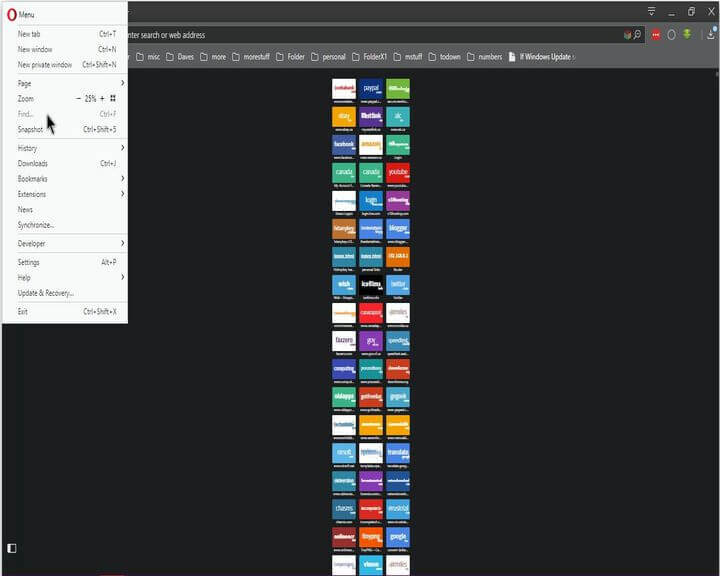 I usually like to put a background picture on Opera but Speed Dial makes it a fruitless venture because the tiles usually cover the entire page. Up to version 28 you could at least display Speed Dial in two columns and make the tiles smaller. With the subject of your picture to the left or right you could still make it work. But then came version 29 and those options were gone, so now we are stuck with three columns and no resize– not directly anyway. I did find a way to adjust them, to make them bigger or smaller, so the chosen background picture will show through. In the very top left-hand corner of the browser, click on the red Opera icon. In the menu that drops down, look for the Zoom option. Click on the “–“ (minus) symbol before the 100% to zoom out to make everything smaller– the smallest size is 25%. Or zoom in by clicking on the “+“ (plus) sign to make them larger– it goes up to 500%. That’s all there is to it. I was aware you could zoom in and out of a web page, but I admit I did not realize it could be used with Speed Dial. 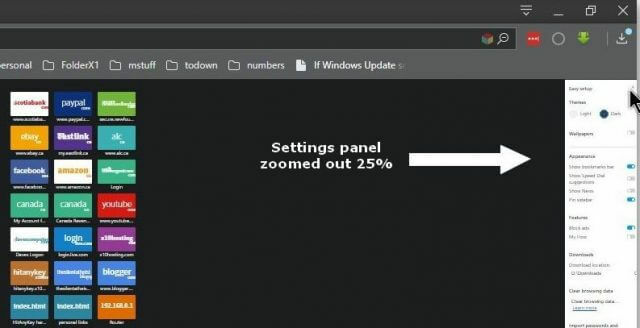 Zooming doesn’t change the picture size, but it will change the size of the Settings panel when opened. Also, when you are zoomed in or out you will notice a new icon at the right end of the URL or Address Bar (a magnifying glass with a minus or plus sign in it). Clicking on it will open a little menu and give you the same options of zooming in or out. It also has a reset button which will reset to 100%. is it worrisome that opera is a made by china? maura. It is not where software is developed, rather if it works. I use Opera on occasion, but am somewhat annoyed with the constant updates. It is like they want to push a newer copy ever time they fix a bug or make a tiny improvement. See no reason in waiting a month or two, receiving customer feedback, but each company has their plan on what works for them, Mindblower!